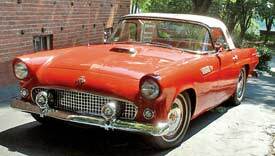 We've finished the Thunderbird project. That is, the basic project is completed and we're now taking the car for longer and longer test-drives to make sure all the parts are secured and there are as few as possible of the little "surprises" that always crop up after a restoration project. So far, so good, and very few adjustments have been necessary after some careful test-driving. Hold On, What Happened Between The Wiring Article And Now? It's worth lining the car with insulation. 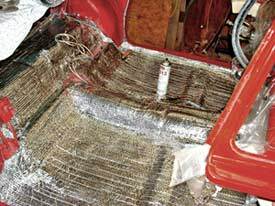 We lined every square inch of the inside of the body with insulating wrap (aluminum sheets sandwiched over a bubble-wrap core) to help lower noise levels and keep out some of the heat. After that we glued carpeted liner throughout the trunk and then turned to the interior trim. Vinyl material was glued in place and the kick panels and other trim panels installed. Whenever anything that would be considered a "final" piece was installed we covered it with clear plastic to keep it from getting scratched or stained. The carpet was laid in carefully and then the seat was installed. Actually, the seat was installed twice because we found that the power rack assembly kept the seat too high and too far forward, even when set at its lowest — and rearmost — point. 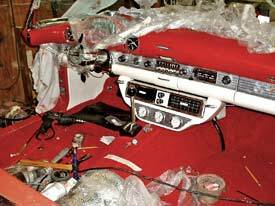 Careful examination of the Ford drawings showed that the mechanism was designed this way to accommodate the folded soft top behind the seat. Since we don't have a soft top and the seat was uncomfortably close to the dash, we removed the rack and motors and simply laid the seat on the floor and as far rearward as possible. Sitting on it in this position proved to be just right, so the decision was made to mount the seat permanently and sell off the power rack assembly. The carpet looks pretty nice under the newly restored dash, eh? During all this interior work we left the doors off the car for easy access. These we moved to the workshop where we built a jig for the hinges and hung them over the workbench. This allowed us to fit them out with the lock and window regulator mechanisms without worrying about scratches and nicks. The doors would be just about the last items to be installed on the car. 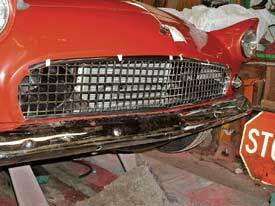 With the paint buffed out and the knowledge that everything was in place we installed the grille and headlights and parking light assemblies. We took our time doing each job to avoid scratches and nicks and used masking tape at points where pieces slid against each other. After making sure the parts were fastened securely and looked correct we installed the front and rear bumpers. The grille and bumper are mounted and the trim piece above the grille is positioned. Bumper installation requires careful attention, for the obvious reason that they are heavy and long and therefore easy to damage the body. Everything was assembled loosely and then shimmed, adjusted, aligned and tightened. The front bumper took about 2 hours to install correctly and the rear bumper a bit more time. The exhausts exit from the overriders on the rear bumper and it took a lot of time to get the proper tolerances on both sides. The secret to all this was patience. Now it's looking like a car! Each piece of trim was installed slowly and carefully to ensure that it wouldn't damage the painted surface. It didn't take more than a couple hours to install all the exterior pieces and the appearance of the car changed dramatically during the process. Installation of the hard top was relatively uneventful, but we were introduced to the flimsiness and flexibility of old-technology fiberglass when we positioned it over its clamping points. The new weatherstrip was stiff and the top twisted and flexed tremendously, leading us to realize that each removal and installation would be an exercise in alignment — at least until everything takes a "set" over the next few months. We let the top relax in its position for a few days before adjusting the side windows. Each day we would tighten the clamps a little more to collapse the weatherstrip. When the car was fitted out completely we replaced the doors. First we removed the hinges from each door and remounted them on the car's A-pillar. To install each door we made a little wooden cradle (that fit the shape of the bottom of the door) and placed some clean carpet over it. The cradle was mounted on the floor jack and then the door could be raised and lowered gently while it was aligned to the hinges. This took some time but it is a far superior method compared to holding the heavy door in the air and trying to get it in position. Each door took about an hour to mount and align and adjust the latch. Once we had both doors in place and allowed them to rest (sag, if you will) overnight we installed the trim panels and armrests and handles. Following that we glued on the weatherstrip. After test-driving the car a few times and making the necessary adjustments we were satisfied that the wiring in the engine bay could be dressed up and finished off. We wrapped the harnesses with plastic electrical tape and installed hangars in certain places so that nothing would get rubbed or pinched. 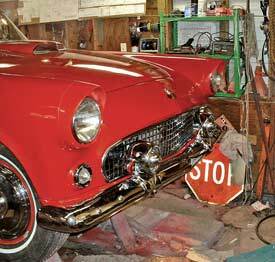 With the completed project came a great sense of satisfaction, but we've done this often enough to know that there will be a number of surprises that accompany driving the car. Will it drive smoothly or overheat or leak? Will pieces fall off? Will it leave you stranded? There's no way to answer these questions without driving the car, so we proceeded with our usual method of taking longer and longer drives. The first few forays out on the road were just around the block, followed by longer (5-10 minute) trips and then eventually out onto the highway. Initially, we found little problems on each short trip. The transmission's fill pipe leaked, the steering was loose (forgot to tighten the tie rod ends), the sway bar clunked (tightening, again) and the exhaust rattled against the underbody. At this stage we've driven about 75 miles total and most of the gremlins have been sorted out. It's still a little hard to steer but we need to put it on an alignment rack to get everything "dialed in." The engine runs cool and the overdrive automatic allow it to turn 1900 rpm at 65 miles per hour, a far cry from the old days when it would have been screaming at 3000 rpm. There's a little wind noise from the top/window interface, but we're pretty sure these things were worse from the factory. All in all, we're pretty satisfied with the results and have already received a number of compliments when filling up at the gas station or stopped at lights.